This 20-minute Non-Dairy Almond Caramel Pudding is made with 6 ingredients and delivers a ton of comforting flavors all year round. On the lookout for non-dairy, gluten-free desserts that you can enjoy all year round? Something you can quickly prepare and serve to guests with food intolerances? Well, we got you covered! 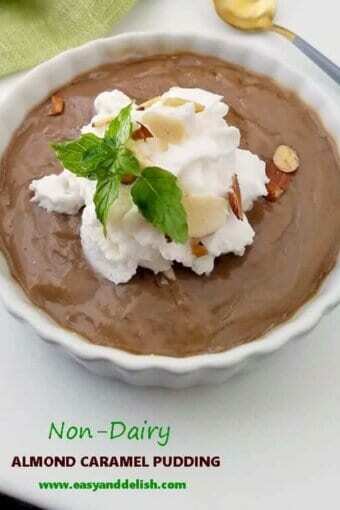 This spoon-licking Non-Dairy Almond Caramel Pudding fits all the above and more. It’s creamy, comforting and quite indulgent… a real hit! It’s also unbelievably simple to prepare, requiring no cooking skills. All you need to do is to combine brown sugar, lactose-free butter, and 1/2 cup almond milk in a saucepan and cook for 5-8 minutes, stirring occasionally. 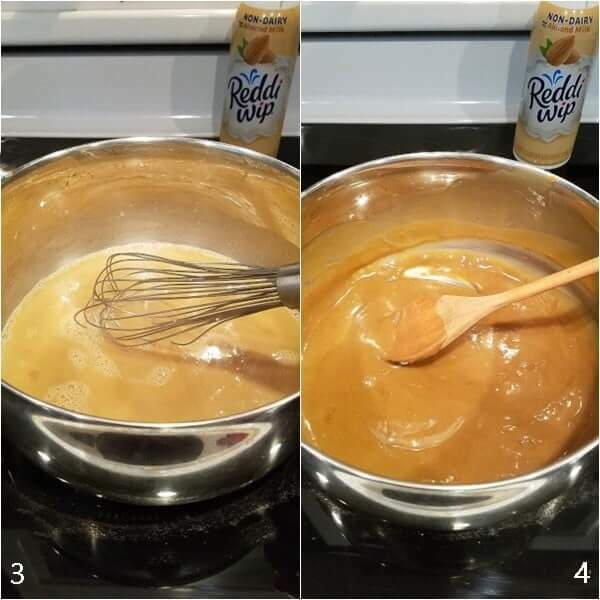 Once mixture turns a dark caramel color, whisk in cornstarch dissolved in the remaining almond milk, boil and then simmer for 5-6 minutes, stirring constantly, until pudding thickens. Stir in almond extract, pour into ramekins, let cook, cover, and refrigerate until fully set. 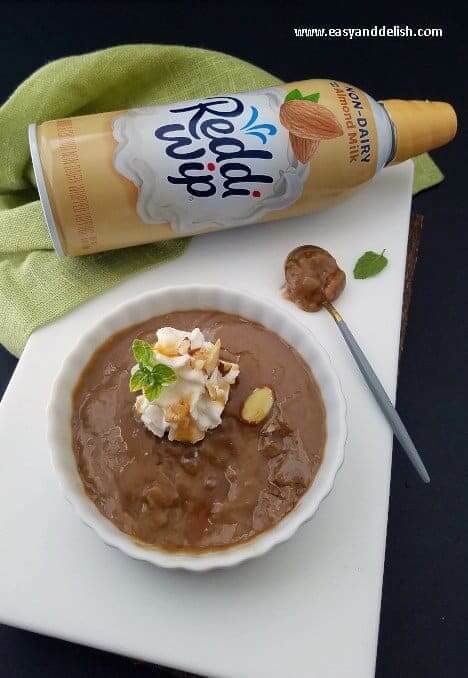 Right before serving, place a generous dollop of Reddi-wip® Almond Non-dairy whipped topping and garnish with toasted almond slices if desired. There you have it: an elegant, crowd-pleasing dessert for any and all seasons. … including Reddi-wip® Almond Non-dairy whipped topping , which has all the Reddi-wip® goodness you crave, without dairy, gluten, artificial flavors or artificial sweeteners. It’s perfect for topping off your favorite desserts, fruit, your coffee, and of course, our Non-dairy Almond Caramel Pudding. So yep, add a little, enjoy a lot! Stir in brown sugar, butter, and 1/2 cup almond milk in a saucepan. Bring to a boil, reduce heat to medium-low, and simmer for 5-8 minutes, stirring occasionally, until obtaining a dark caramel-like color. In a bowl, whisk cornstarch together with 1 cup of almond milk until fully dissolved (with no lumps). Stir in the rest of the milk and add to the brown sugar mixture. Return to a boil, reduce heat to medium-low, and simmer for about 5-8 minutes, stirring constantly, until pudding thickens. Remove pan from heat and stir in almond extract. Pour pudding into ramekins, let cool, cover, and refrigerate until set. Serve with a generous dollop of Reddi-wip® Almond Non-dairy whipped topping and garnish with toasted almond slices, if desired. See? Easy peasy! In less than 30 minutes you have an indulgent dessert to enjoy and share with guests. To quickly toast almonds, heat a no-stick skillet over medium heat. Put in the almonds and let them toast, shaking pan occasionally, until lightly golden brown and fragrant. Transfer to a plate and let cool before storing them in a plastic bag at room temperature. Use as a garnish for our Non-Dairy Almond Caramel Pudding. This less-than-30-minute Non-Dairy Almond Caramel Pudding is made with 6 ingredients and delivers a ton of comforting flavors all year round. Stir in brown sugar, butter, and 1/2 cup almond milk in a saucepan. Bring to a boil, reduce heat to medium-low, and simmer for 5-8 minutes, stirring occasionally, until obtaining a dark caramel-like color. This pudding is starch-thickened and so called blancmange in the UK. To toast almond quickly, use the stovetop. Heat a no-stick skillet over medium heat. Place almonds into the skillet and let them toast, shaking pan occasionally, until lightly golden brown and fragrant. Transfer to a plate and let cool before storing them in a plastic bag at room temperature. Looking for other non-dairy/dairy-free treats? Try our Dairy-Free Caramel Pumpkin Spice Hot Chocolate. I’m passing the recipe along to a neighbor. 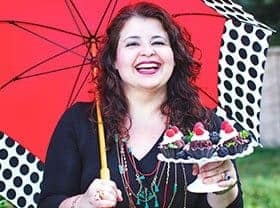 She and her husband only use almond milk and both have a real sweet tooth. This would be a perfect dessert for them. Ty! I hope they have the chance to try and enjoy. Non dairy pudding? Count me in, sounds fabulous!